Right now, Amazon has Certified refurbished Kindles and Fire tablets on sale for 25% off. There are a variety of devices available. There are several Kindle e-ink Paperwhites in various 3G and Wi-fi, 1st and 2nd generation devices starting at $89. There are also some good deals on previous generation Kindle Fires – these are the ones with the micro-HDMI connector that is no longer included on current models. There is even a 4G LTE model. All of the devices I saw had special offers, but Amazon will remove the offers for a fee. All certified refurbished Kindles and Fire tablets come with a one year warranty. These are a great deal for someone looking for a value. Over the years, I have bought several refurbished Kindles and Fires and they have performed beautifully. How about you? Would you buy a refurb? 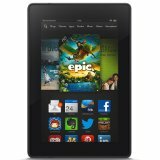 This entry was posted in Daily Deals and tagged certified refurbished, Fire Tablet, Fire tablets, Kindle, Kindles, sale. Bookmark the permalink.